Q: What do Airstreams, sound art, handmade bags, and live experimental music have in common? A: A Factory 500 Membership tour, of course. Three or four times each year, the Mattress Factory staff plans a unique evening of places you just don’t get to see every day for our Factory 500 members. In the past we have toured a wig-maker’s studio, a brewery, a metalsmith’s studio, and a mayor’s home constructed with two shipping containers. On July 15th, Factory 500 Members toured the West End and North Side neighborhoods. 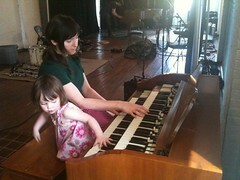 The evening began at Wendy Downs’ and Jeremy Boyle’s studios in the West End of Pittsburgh. The first floor of their building is home to their quietly brilliant Moop shop where they design and hand make every bag from start to finish---and demonstrated their amazing craftsmanship before our very eyes. Wendy and Jeremy explained what brought them to West End in Pittsburgh after living in Western Massachusetts. Upstairs in Jeremy’s studio, he showed the crowd how he has created sound pieces with pneumatically controlled drums. A 1979 Airstream motor coach awaited the Factory 500 members in the Mattress Factory’s parking lot. Mitchell Schwartz and Elaine Stone entertained dozens of guests in their Airstream with martinis, sangria and snacks. Curator-in-residence, Mark Garry, screened John Cage’s “Water Walk” film al fresco. 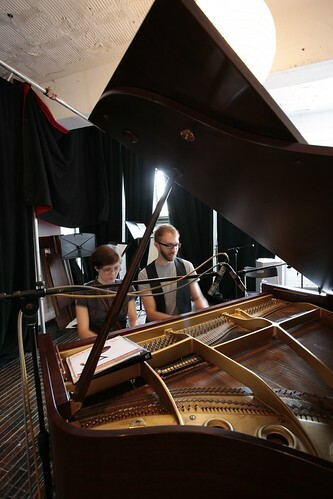 To wrap up the evening, the artists of “A Generous Act: A collaboration with music” did a sneak peek performance for the group in their recording studio located on the 4th floor of the Mattress Factory. Performing beautifully composed and performed pieces that had been created during their 16-day residency, the artists amazed the Factory 500 members with the huge amount of innovative work and camaraderie that can be accomplished in a short two-week span. Thanks to everyone for a fantastic art-filled summer evening! Feel like you're missing out? 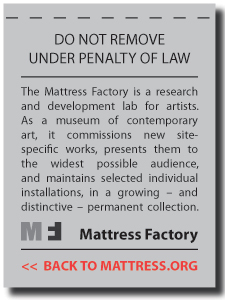 If you’re interested in becoming a member at the Factory 500 level (or any level), feel free to contact us via email at info[at]mattress[dot]org or calling the museum at 412.231.3169 (and, yes, we can break down membership dues into monthly payments). Part of my role as Director of Education here at the Mattress Factory involves coordinating internships. This is great because I have the unique opportunity to meet and get to know many young students as they assemble a professional pathway or imagine their post-graduation role within the world. For some, an internship can give insight into what it is they are passionate about and how to translate what they love into what they do. For others, an internship can be a stepping-stone or a bullet point on their resume. An internship can show an individual as much about what it is they do NOT want to do, as it can about what they do want to do. No matter the outcome, an internship can be a life-altering experience that forces a change of major, change of perception, or perhaps just a change of scenery. Anymore, I find that college students want bigger, longer, and more intensive internships—they want to stay for two (or three) semesters instead of one, want to spend 20 (or 40) hours at the MF, instead of 12. This new trend is so mutually beneficial. The individual gets the inside scoop and is folded into the full-time staff as an integral member. The organization gets a whole lot more work done! At the Mattress Factory, we are lucky to have interns from all over the world -- from local universities, and from universities far and wide. We have enjoyed working with interns with a range of ages and interests. Some have master’s degrees, some don’t yet have high school diplomas. An individual’s unique perspective and experiences are what draws us to them (and probably vice versa). Having an intern means developing projects, asking and answering a million questions, giving advice, and in the end it means saying goodbye to somebody who you probably grew to depend on. In many cases, it can even mean saying goodbye to a friend. But, in the BEST cases, it means watching somebody take off into a wild world of choices and opportunities, hopefully made a little easier by having had a fruitful experience working at the Mattress Factory. A Generous Act: FREE Performance for MF Members! If you've been by the museum during the past week or so, you might have noticed that the 4th floor is currently closed to visitors. That's because we've converted the entire gallery on that floor into a high-end recording studio. 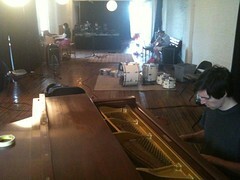 Inside the studio/gallery are a group of musicians, assembled by guest curator Mark Garry, writing and recording music. 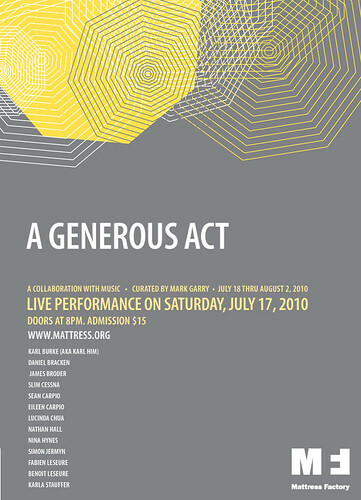 The project, entitled A Generous Act, is part exhibition and part performance, and will debut on Saturday, July 17th, at 8:00PM. A cool e-flyer designed by MF Shannon is embedded below. Feel free to share. Tickets for the opening debut performance are $15.00, but as a special perk for current Mattress Factory members, we're offering FREE admission to those who have current memberships (limit: 2 per member). Now that's a generous act! You can reserve your spot by completing the form below or by clicking HERE. Hurry, seating is extremely limited!